The monthly walk in September will take place in Fernkloof Nature Reserve. Please meet in the parking area at 8:00 am. Ronnie Hazell will lead the walk which should cover a couple of kilometres. To ensure that you get one please make payment by EFT to Hermanus Bird Club, FNB Hermanus, A/C No. 62107045892 clearly stating Calendar and Purchaser’s name. Cut off for sales will be mid-September 2018. 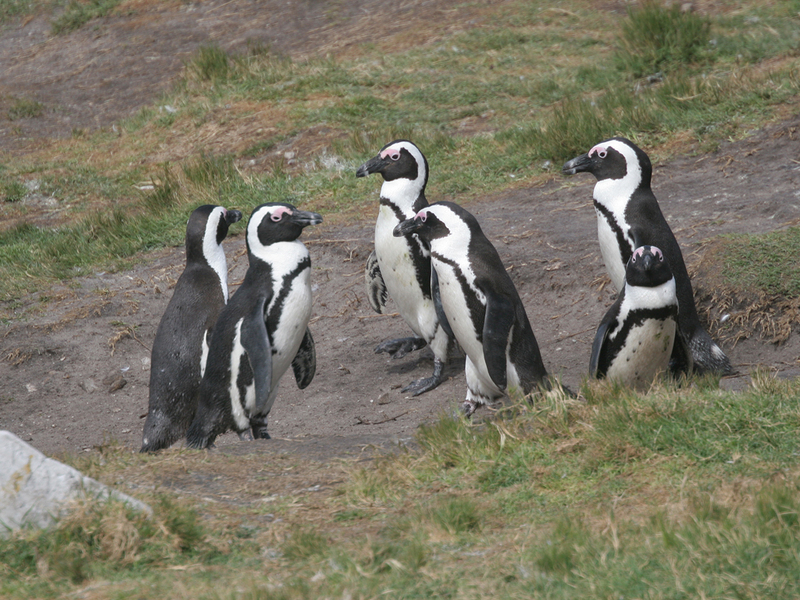 Members are reminded that the next club meeting is at 6:00 for 6:30 on Wednesday and that it will be addressed by Pinky Ngewu, who will be talking about Penguin conservation on Dyer Island. This is an urgent appeal!! Twelve members of the Hermanus Bird Club participated in a most enjoyable and productive morning walk, along the Vermont Coastal Path, led by John and Sheelagh Bowman. The late winter weather was perfect for birding, starting off crisp and clear, but soon warming up. Not a breath of wind. The birding got off to a great start, with a Subantarctic Skua spotted out to sea, from our meeting point. The walk along the Coastal Path to Brekvis Bay produced an interesting collection of bush and coastal birds. At the Bay, we saw both a Common Greenshank, and an African Darter. Mike Ford, who has been birding in the area for some nineteen years, had never previously seen these species along this bit of coast! We continued the walk to Aas Baai, where more species were added to our list. These included a male Giant Kingfisher, several African Black Oystercatchers, and Swift Terns. On the way back we were rewarded with a magnificent close up view of a Southern Tchagra. Also, early returning migrants in the form of Little and White-rumped Swifts. And, as a bit of variety, offshore a Hump Backed Whale. Also good to see evidence of Cape Clawless otters living in the area. From the parking area we drove up to Vermont Salt Pan, where with water in the Pan again, we added usefully to our bird list. Good to see a couple of Pied Avocets back. Altogether, a lovely morning. Thanks to all the hawk-eyed members who were able to help us find the birds: 55 in total! And to Ronnie Hazell for taking the great photos. Subantarctic Skua, Bar-throated Apalis, Bokmakierie, Pied Avocet, Southern Boubou, Cape Bulbul, Cape Canary, Levaillant’s Cisticola, Cape, Reed, and White-breasted Cormorants, African Darter, Red-eyed Dove, Yellow-billed Duck, Cattle and Little Egrets, Common Fiscal, Fiscal Flycatcher, Egyptian Goose, Harlaub’s and Kelp Gulls, Black-headed and Grey Herons, African Sacred and Hadeda Ibises, Giant Kingfisher, Blacksmith Lapwing, Rock Martin, Common Moorhen, Speckled Mousebird, African Black Oystercatcher, Speckled Pigeon, Three-banded and White-fronted Plovers, Karoo Prinia, White-necked Raven, Cape Robin-chat, Cape Sparrow, Cape Spurfowl, Common Starling, Black-winged Stilt, Southern Double Collared Sunbird, Little and White-rumped Swifts, Southern Tchagra, Cape Teal, Swift Tern, Olive Thrush, Cape Wagtail, Common Waxbill, Cape Weaver, Common Whimbrel, Cape White-eye. BirdLife South Africa’s Secretarybird Project would like to request your assistance in locating breeding Secretarybirds across Southern Africa. If you have any historical records of nest localities that you would be willing to share with us, or if you come across a nest while out birding please can I ask that you submit this information to Dr Melissa Whitecross (Raptors & Large Terrestrial Bird Project Manager) via email melissa.whitecross@birdlife.org.za. The key information required is the date of the sighting and the GPS location of the nest to within 20m. Any additional information that can be obtained without causing unnecessary disturbance to the birds such as the number of eggs/chicks present will also be appreciated. To stay up to date with the Secretarybird Project please like the Facebook page (https://www.facebook.com/secretarybirdconservation/).